click image for close-up Two runaway slaves in a swamp, confronted by three vicious mastiffs, are the subject of this powerful painting by artist Richard Ansdell. 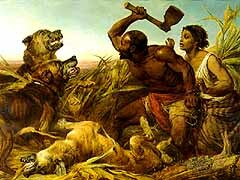 The painting, entitled Hunted Slaves, was presented in 1861 at England's Royal Academy, where it was well-received by critics keenly aware of the Civil War taking place in the United States. The literature accompanying the painting included an excerpt of Henry Wadsworth Longfellow's 1842 anti-slavery poem, "The Dismal Swamp". . .